Download the Tech-Link 2.0 software by clicking on the "Download Software" link above. The file "Tech_link_20.zip" will be found in the specified download location. Unzip the file using the windows explorer. The folder "Tech-Link 2.0" is inside the zip file. 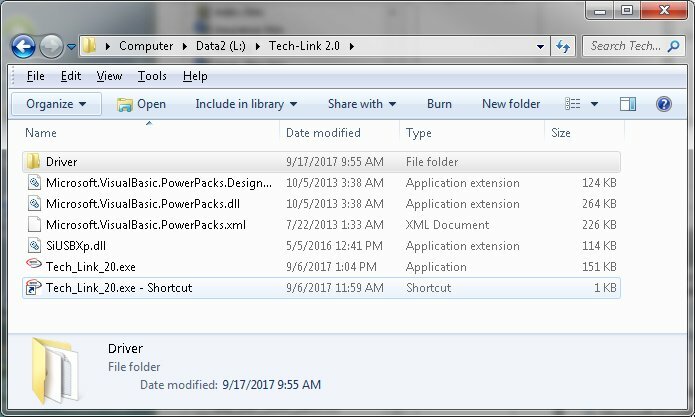 Copy this folder "Tech-Link 2.0" to the desired location such as the Desktop, C drive etc., using the windows explorer. Using the windows explorer, browse to this folder and create a shortcut to the executable "Tech_Link_20.exe" using the windows explorer. Copy the shortcut to your desktop. Microsoft .NET 4.5 (or later) framework is required for Tech-Link to operate. You can easily check which versions you have installed by viewing the "Programs and Features" located in the Control Panel. You can download it HERE. If you are not sure, you can just install it anyway since it won't hurt anything. 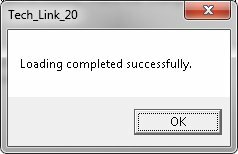 To test the software installation, double-click on the "Tech_Link_20.exe" shortcut. You should see the error message window shown below at this point. If not, re-check the above steps. 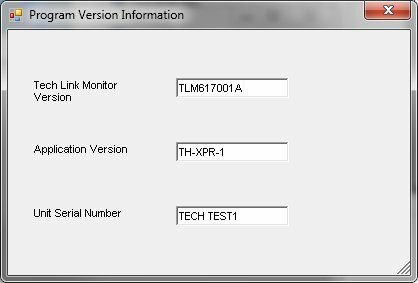 Folders containing the TH-2 software will also be added to the folder "Tech-Link 2.0". They will be named TH, VT, UM etc. For now, proceed to the next step USB Driver Installation. For Windows 7 go to STEP 2 below. For Windows 8/10 continue. Windows 8/10 enforces driver signatures by default and must be disabled to install the USB driver. The USB driver itself is supplied by Microsoft and is signed. Just the "inf" install file is unsigned. Use the following steps to temporarily disable driver signature enforcement. Note: youtube has many instructional videos on this subject. 3. Your computer will restart and then you will be able to install the USB driver. On the next restart, the driver signature enforcement will be re-enabled. Using the windows explorer, browse to the "Driver" folder under the main folder "Tech-Link 2.0". 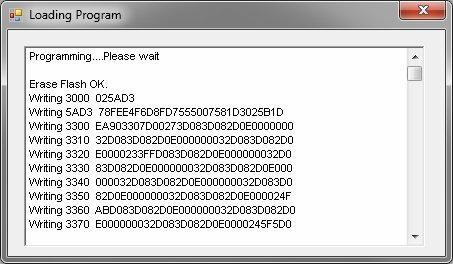 For Windows 64 bit, double-click the executable "Tech-Link_2X_USB_Driver_Installer_x64". For Windows 32 bit, double-click the executable "Tech-Link_2X_USB_Driver_Installer_x86". Depending on permission settings, you may need to run the executable as the administrator. This can be done by right-clicking the target file and selecting "Run as administrator". This will begin the driver installation process by starting the wizard. Click - Install this driver software anyway. This completes the driver install. You can now proceed to download/install application software. There are two main modes of operation Program and RT. 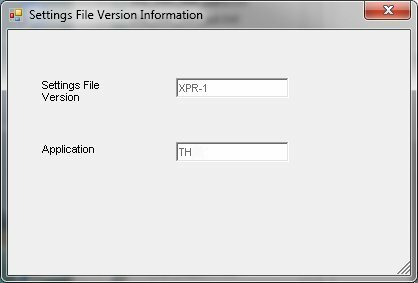 In Program mode you can load an application file, load/save a settings file and modify the settings statically. To enter this mode, start with all power turned off, connect the TH-2 to the PC via the USB cable and run Tech-Link. The mode status on the top right of the Tech-Link window will indicate "Program mode". You can now use the menu items under Program and Settings. make adjustments to the settings etc. then turning on the TH-2 external power and radio power (Tx, Rx, servos etc.). From the Tools->Enter RT Mode dialog click on the "RT mode" button. The mode status on the top right of the Tech-Link window will indicate "RT mode". You can now use the menu items under Settings and Tools. Note: RT mode can only be entered from Program mode. Browse to the application folder under "Tech-Link 2.X" and select the "hex" file. Click Open. A window will open and will say "Programming.... Please wait"
When completed, a message box will inform you. Modify - Select the setting you want to modify, make the changes and click Write to store the setting. Browse to the application folder under "Tech-Link 2.X" and select the desired "cst" file. Click Open. 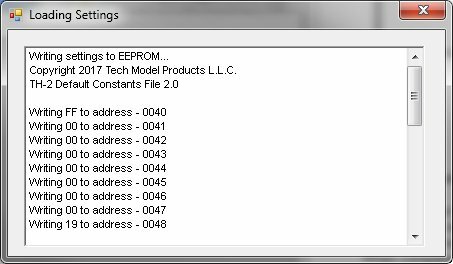 A window will open and will say "Writing settings to EEPROM...."
Browse to the application folder under "Tech-Link 2.X" and enter the desired filename. Click Save. A window will open and will say "Saving settings to file...."
"Save complete. Errors = 0". Version - Displays the settings file version and application. Enter RT Mode - Click the button to enter RT mode. See "Modes" above for proper setup. 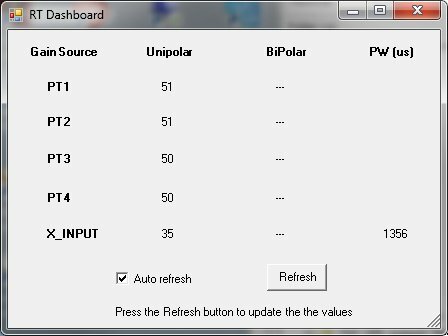 RT Dashboard - This dialog allows you to see the values of the five external gain settings. positive (0..100) or positve/negative (-100..100) numbers representing a percentage. displayed. This is the actual PPM pulse width sent from the receiver. Note: Output from TH-XPR-X application shown. RT Monitor - This dialog shows a graph of the inputs and outputs. It can help visualize the mixing and assist in troubleshooting. a maximum of 2000 us. The graph has a range between 900 us and 2100 us. 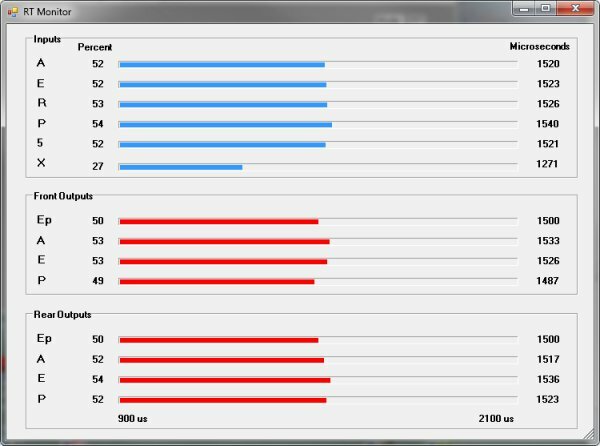 The right side shows the PPM pulse width in microseconds.